For the fritters, combine the cake flour, castor sugar, baking powder and salt in a small bowl. Blitz half of the kernels and the melted butter, eggs, buttermilk and vanilla extract. Add the buttermilk mixture to the dry ingredients until just combined. Fold in the remaining kernels. In a small pot (use a sugar thermometer to check the temperature) or deep fat fryer, heat the sunflower oil to 180°C. Drop tablespoonfuls of batter, a few at a time, into the hot oil. Fry until golden brown, about 2 minutes per side. Drain on paper towel. For the caramel sauce, dissolve the brown sugar and Maldon Sea Salt in the water in a saucepan over medium-high heat, 15 minutes, or until the sugar is caramelised and a thermometer registers 140˚C. Remove from heat and add the cream and butter, stirring. 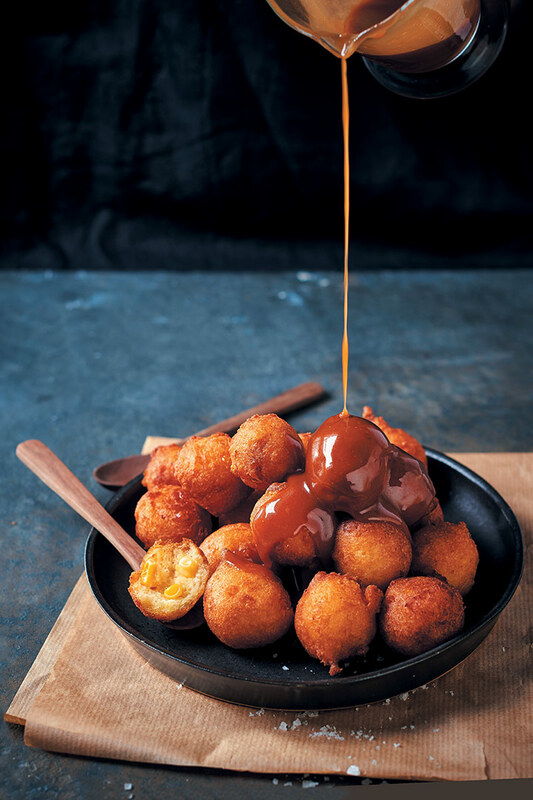 Serve the fritters alongside the caramel sauce.